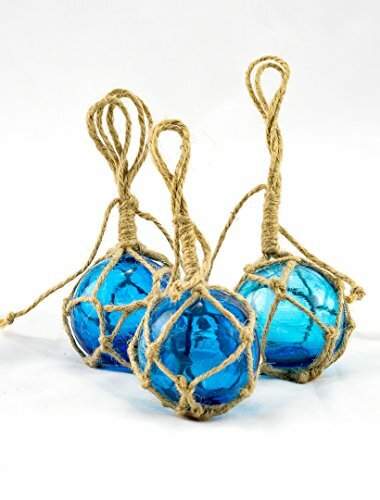 Nautical Crush Trading Aqua Glass Float Fishing Buoy Balls are perfect for adding that costal or tropical look and feel to your home decor, beach themed wedding, nautical themed party, or Christmas tree. This beautiful piece will inspire you to add a hanging sea-side accent to any party, wedding or christmas tree. *Perfect for Nautical Decor, Beach Side Weddings or Tiki Hut decorations! *Great hung near a window with the sun shining through! Glass Floats are a historic mainstay of nautical ventures. Traditionally, these hollow spheres were used on ocean waters, fixed on the upper part of the fishing nets so that they stay on the surface, to keep these nets from sinking. Floats of all sizes and colors were used, ranging in size from a golf ball to a tennis ball, up to a soccer or basketball. Glass floats have, over the last several decades, for the most part been replaced by floats made of aluminum, plastic, or Styrofoam, but their traditional nautical look is forever engrained in coastal life. Every so often, especially after strong storms and heavy winds have passed through, beachcombers in Oregon, Washington and other areas have found these hollow glass balls cast up onto the beach. Set of 6 glass floats are 2", loop is an additional 2.5"-3"